2012 NASA's Solar Dynamics Observatory snapped this view of the powerful X1.7-class solar flare that erupted at 1:37 p.m. EST on Jan. 27, 2012. This story was updated at 4:13 p.m. EST. A massive solar flare — the strongest one so far this year — erupted today (Jan. 27) from the same active region of the sun that triggered a raging solar tempest earlier this week. The solar flare was rated an X1.7-class eruption, according to the National Oceanic and Atmospheric Administration (NOAA). X-class flares are the most powerful type of solar storm, with M-class storms falling within the mid-range, and C-class flares being the weakest. Several spacecraft, including NASA's Solar Dynamics Observatory and the Solar Heliospheric Observatory, observed the solar eruption, which occurred at 1:37 p.m. EST (1837 GMT). The flare unleashed a wave of charged particles, called a coronal mass ejection, but space weather experts said it was not aimed at Earth. The flare exploded from sunspot 1402, a region on the sun that has been particularly active lately. Earlier this week, a separate blast from the same region sent a cloud of charged particles toward Earth and sparked the strongest radiation storm since 2003. "It's a great week for Space Weather!" wrote Dean Pesnell, SDO Project Scientist at NASA's Goddard Space Flight Center in Greenbelt, Md., in a blog update. This time, however, the flare was not fired off while the sunspot region was facing Earth, according to Spaceweather.com. Still, an ensuing radiation storm is possible and will continue to be monitored. "Region 1402 is Alive!!!!!!!!!!!!!!" explained officials from NOAA's Space Weather Prediction Center on Facebook. "Another huge X-ray event is in progress." When a powerful X-class flare is aimed directly at Earth it can sometimes cause disruptions to satellites in space and power grids and communications infrastructure on the ground. Strong flares and coronal mass ejections can also pose potential hazards to astronauts on the International Space Station. In response, NOAA has issued radio blackouts and a radiation storm warning while the sun storm is in progress. "This warning is in effect for the next 24 hours," agency officials said in a statement. NASA's SOHO satellite took this photo of an X-2 class solar flare that raged on the sun today (Jan. 27). 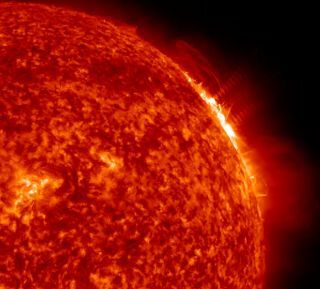 Presently, the radiation levels appear to be climbing, but the effects of this solar storm are not expected to be worse than earlier this week, said Doug Biesecker, a physicist at NOAA's Space Weather Prediction Center. "The radiation storm will almost certainly be weaker," Biesecker told SPACE.com. "The coronal mass ejection seems to be headed well away from Earth, which is good because this one seems like a bigger beast than the last one, but that's still preliminary." Solar storms can also amp up auroras (also known as the northern and southern lights), which can create stunning light shows for skywatchers at high latitudes. The sun's activity ebbs and flows in an 11-year cycle. Currently, the sun is in the midst of Solar Cycle 24, and activity is expected to ramp up toward the solar maximum in 2013.